This is going to be a very long thread, I suspect I may be adding to it for at least a year. The machine is a vertical milling machine that very roughly will fit within a 1 Metre cube Travels are Y300 x X520 x Z250 Quite easy to extend if you have the room, I do not. I have drawn in a Chinese high speed spindle, this will work fine for non ferrous metals, most plastics and wood. For steel a slower more powerful spindle will be a better choice that is an option for the builder. As you can see I have built a 3D Cad model of the machine. Having built other machines in the past I decided that I did not want to make every part of the machine, In particular I wanted to use laser cut steel where possible and this includes the complex steel molds to make the castings, The molds will be reused by others this will share the cost. Image below is for the cross member that supports the X Axis. As you can see from the images Extensive steel reinforcement is used made from 12 and 8mm all thread these days in Australia very inexpensive. There are also numerous turned steel inserts I made myself on the lathe (Nothing that a small lathe cannot handle) also a number of store bought steel hex long nuts. I am going to post this here in case the forum software will not post; that sometimes happens when you edit for too long. I will then keep going. To build this machine a surface plate will greatly assist while not essential without it much time will be wasted. Observe the image below. The flat plate is the bottom plate of the mold that will form the top of the base, it will be cast upside down. Note the steel bars with multiple inserts projecting from them. They are sitting in rectangular holes These bars were precision ground by an outside contractor. Not very well unfortunately so I spent many hours scraping them flat, the inserts are epoxied in after the grinding, this will no doubt not make sense at the moment it will later. The join between the bars and the base plate, part of the mold not the machine will be sealed with silicone. 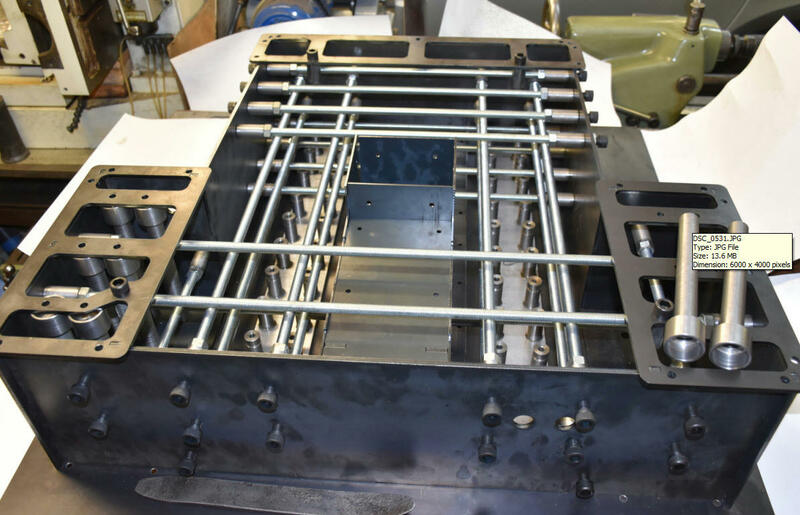 The scraped face of the bars will be aligned by the face of the surface plate and constrained laterally by the laser cut holes in the mold plate, when the mold is removed the the bars will be left projecting 5mm from the casting. These bars will be used mount the linear rails. Example of how the rails will be aligned by Laser cut Then countersunk by me later cams Held by 30mm x M8 CSK machine screws, screwed into the pre turned drilled and tapped inserts glued into the lapped mounting bars. (Prior to drilling and tapping the M6 holes to mount the liner rails). This will be done after the casting has been made, small errors in placement prior to casting is easily corrected here. The cams will also make a very rigid mount for the rails. The inserts sit slightly below the surface of the scraped bars The only significant force on them is the force applied by the machine screw, they are deeply cast in, there is little chance of them pulling out. As shown the molds are bare metal, the next step is to disassemble them then wrap the individual pieces in self adhesive plastic. This is the primary mold release it will also be coated with silicone mold release prior to casting. There is no reason apart from the time needed to construct them that Say painted MDF molds could be used. There is no welding of any machine part apart from whatever tube frame is used to make the stand it sits on. I am making the cross member mold first. The images are not quite complete there are a number of small parts to be added before the first casting. I will be using the same epoxy aggregate mix I used for the epoxy warden grinder I posted here some years ago. Once cast I will post. I worked on a CNC mill made of composite material it was an OPS Ingersoll made in Germany and worked pretty well except before we bought it someone tried to lift it with a fork lift truck and it had slight damage to front base casting. I thought I should talk a little about how the machine castings will be assembled and aligned. The Base and cross member support the X and Y axis linear rails, together with the 2 columns this assembly defines the X, Y and Z geometry of the machine. My plan is to fit and properly align the linear rails to the base and cross member castings first before assembly. As noted previously the rails are mounted on steel supports that were aligned to the surface plate before they were cast in position. After the casting has cured these support plates will blued and rechecked against the surface plate again. This will confirm if any errors are present that need to be finally corrected by scraping. At this point I will be able to move on and set the rails in position on their respective castings before the machine is assembled. This is where the cams come into play. Remember the M6 tapped holes have not yet been drilled in the rail support plates. The cams allow about 1.5mm of lateral adjustment this is more than enough to correct any lateral misalignment of the support plates in the casting mold. The cams allow extremely fine adjustment of the rails I have already tried this, it turns a chore into a joy, left in position they also provide very strong lateral support for the rails. The laser cut mold base plate shown was checked with a Moore & Wright 600mm precision square for squareness it was perfect by eye measurement. Measuring the piece I could find no outside the design plan errors, all was well within 0.1mm. When mounting linear rails there is a built in tolerance that allows slight adjustment after the rails are positioned. The rails I am using have 7mm counter bored holes provided, the cap head mounting bolts are M6. the hole spacing in this case is 60mm, there are a lot of holes to drill and tap. Once drilled this allows a .5mm lateral adjustment for any mounting or positioning error provided the holes are perfectly drilled and tapped on center, I have made a drilling jig to do this. without a jig it is easy to get one or two holes of center maybe binding and forcing the rail to the side. The base plate and cross member castings with their attached rails are supported by the two columns. They all have to be aligned. I considered this for some time, what is the best way to do it? For this design I decided to simply attach the columns to the base without adjustment. The columns are bolted to the base with 6 by M12 high tensile all thread and nut fastenings. 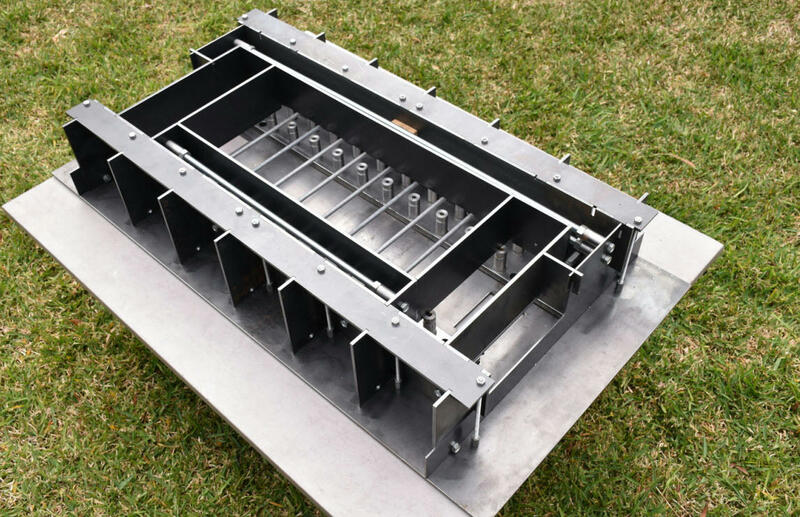 Both the base and the column base have 10mm laser cut and drilled mild steel plates cast in position, the plates have been flattened on the mating sides this will form a very rigid joint. I do not expect the columns to be perfectly aligned to each other. I do however expect them to be within the allowed tolerance. My plan is to do all the alignment of the X Y and Z planes using built in adjustment of the cross member. There are built in screw jacks in the cross member that will allow me to align the rails, this will leave a gap between the cross member and the two column mounting faces. This gap would certainly not provide a rigid joint, it will be filled with epoxy grout (a mix of metal powder and epoxy) I make my own, Google "Epoxy Bearing material and method" or Moglice If you want to know more. Once this has been done the jacks have done their job and will be no longer operable unless the grout was removed. The machine frame will be one integrated rigid unit. The rail drilling jig mentioned previously in this thread. After studying various alternatives I decided to use the rail bearings themselves to mount the drilling jig I also made a center punching jig and mounted that on a bearing as well the bearings will be later used on the machine. The counter bored holes on the rail itself provide an ideal locating point. Note in the images below how this is done, there is a hardened drilling bush that slides into the counter bore locking and centering the bush drill and punch together with the precision linear bearing this creates a very accurate setup. easily made from mild steel. Also note the two 2.5mm in the cams, these are for a pin wrench to allow adjustment. The cams are 4mm thick. Accurately Drilling over 100 holes through 16mm steel plate would require a great physical effort, my bench drill press is too small. I needed a small hand drill press that I could attach to the drilling jig. Remarkably I found one at the side of the road (in Australia we have hard rubbish days once or twice a year) It was made by AEG. Perfect for what I wanted to do. I found out later they are quite inexpensive. I already had an AEG drill that fitted. Drilling a through hole against the epoxy aggregate would result in a chipped dull drill, I have decided to glue a strip 12mm sq balsa wood to the steel rail mounts behind the drill line prior to casting to protect the tip of the drill and to allow easy through tapping of the holes. The press had a base plate and 25mm steel column. I slid that off and made a new column to fit the jig as shown above, I now have proper control and the necessary leverage to drill the holes. Job done! I forgot to point out that the rails are positioned with the cams laterally before the mounting holes are drilled. The cams are set so that tightening the M8 x 30 CSK screws presses the cam against the side edge of the rail on tightening. the reason for the length of screw is to reduce any tilting of the screw in its tapped hole. Positioning is done with a tenth indicator and straight edge for the first rail then the other rail is set to that. The indicator is mounted on a linear ball bearing that will later be used on the machine. Once the rails are tightened down the positioning may need to be adjusted to correct any small errors caused by the tightening procedure. This is why the drilling is so important, done perfectly we have 0.5 of a mm available if it was. The cross member has a volume of 0.02 cubic metres The granite and silica sand aggregate used weighs about 2200 KG per cubic metre therefore the epoxy composite material used should weigh about 44 KG add to this the steel parts and the component will weigh maybe double that. When I have the time I will compute the steel. Autocad does not do this automatically I have to do it piece by piece. Side View showing jacks, also the joint between the columns and the cross member, green arrows and purple and green lines. It is between these lines that the grouting will be inserted after the machine is aligned. Alignment jacks red arrows oblique view. Also note Left limit switch Right switch not shown. They sit in laser cut protective housings. The switches are moderately priced standard industrial micro switches, rated for millions of operations. I did a quick google search for UK suppliers and found this example, I have no connection to the company. I did not do a comprehensive search, no doubt there are other suppliers. Depending on the aggregate and the particular epoxy used I have found that 12 to 15% epoxy by volume will be needed. There are numerous technical papers on the internet that discuss the mix. The 2.6 litre pack above should be about the right size to make the cross member part. Add a couple of pounds for the aggregate and silica sand and that about it for the casting materials. Notes re laser cutting joints. Some parts have been cleaned and the edges have been ground removing sharp corners. Test assembled without fastenings they just fit together. There are a few basic joints I use two are shown below, one for plain cap screws and one for countersunk screws. Most of the time the screw size is equal to or one size higher than the plate thickness. Countersunk screws require that the hole is countersunk after the laser cutting, an easy job. CSK joints have to be planned carefully to match the screw. This looks an interesting post, keep them coming as you can. Threads like this leave me slack-jawed with amazement. Saying "Wow!" is the limit of my contribution. I agree with S.D.L - please keep publishing. Sometimes the better the thread the fewer the comments! Firstly thank you for the words of encouragement Michael, Steve, Dave and Mike. and Nick from another place. I had a couple of questions re the cams? The first test was made by parting off some 25mm mild steel, drilling the offset 8mm hole than countersinking it. a wood block was used to provide a base. The test worked very well however the time taken was longer than I would like, and this did not include the spanner holes. The countersinking I would have to do. A simple jig was made to hold the part using the spanner holes. The jig was placed in the 4 jaw chuck and centered on the 8mm hole using the tail stock centre. Finally the hole was countersunk using the tail stock ram. the tail stock offered better control. The pins are a good fit. Made from M3 cap head screws screwed in from the back of the jig. I ground the projecting part to 2.5mm to fit the spanner holes in the cam. I also spent some time over the weekend tiding up the cross member mold. It is almost ready to cast! Maybe next weekend if all goes well. Wonderful thread and please do keep posting, the more detail the better! This week I purchased 20 litres of Megapoxy H This was the epoxy I used to make the Epoxy Worden Grinder I made about 7 years ago. and published on this forum. The spec sheet for Megapoxy can be downloaded from their Australian website. I have no connection to the company apart from being a satisfied customer. Yes I am very happy to recommend them they have been most helpful. For other countries there are many companies that will offer a similar product. look for an epoxy with similar physical properties and make sure it does not contain solvents. As the name suggests solvents evaporate causing shrinkage, we do not want any mold shrinkage. To see the casting process page down a little here: **LINK** This project was made some time ago using a simple MDF mold. Have you considered embedding tubes or even wires for stop switches and things like DRO strips directly into the cast? A magnetic scale in the surface could be very neat. I provided for embedded 20mm PVC conduit to carry the y axis servo encoder and drive and the Y axis limits in the base mold. it connects to the control junction box noted earlier in this thread. Aqua blue lines are the mold. As can be seen there is not a lot of room available in this area after the Ball screw, linear rails, limit switches and cable chain are accomodated. See earlier in the thread how the roller end brackets already laser cut are joined. aluminium swarf blinds are available commercially they have neoprene sealed joints to keep coolant out. Alternatively industrial heat resistant conveyor belting could be used, More investigation is required for the best solution at reasonable cost. The belt is not rolled up it hangs down with a weight at each end, Rolling it up dirty I suspect would be problematic. A catchment tray is planned under the table. the rollers are sized for low cost skate board bearings. The swarf guard blinds are supported by the top of the linear rails as well as at the edges, There is also a lip at each end of the table to keep swarf out. in combination with the blind the mechanism should remain pretty clean. This is where CAD comes into its own, every part given its own space, and not much more. Many years ago, 80's, when I worked as a machine tool fitter we had grinding machine's, from memory Studer, whose bases were made from concrete, the reasoning was that manufacture was quicker and they didn't need stabilising. The mechanical's sat on inset plates which stood proud so that when the base was finished the plates could be machined to get everything level and steel plates were embedded into the base underside so that leveling feet could be fitted.